Medical expenses are high and it makes matters difficult for those who do not have access to surplus funds. It is true for the poor and needy sections of the society, especially for those who work in the construction field. 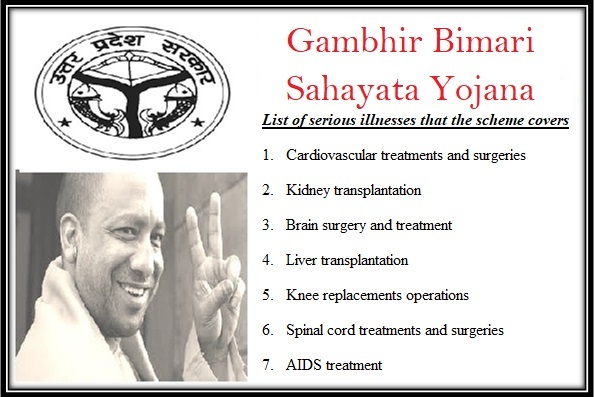 Thus, the state authority of UP has implemented Gambhir Bimari Sahayata Yojana. With this program, it will provide registered labors economic assistance to meet the expenses of eight major illnesses. Empowering labors – Labors do not get a lot of money so that they can meet the medical expenses. With the assistance of this program, they will not have to worry about paying the medical bills. The state will pay on their behalf and empower them. Providing financial assistance – All eligible candidates, who get treatment for identified sicknesses in public hospitals, will not have to pay anything to the hospitals. All bills will be settled by state authority. Eight serious diseases will be treated – All applicants will not get money for treatment of any disease. The state medical board has identified eight major diseases. If the applicant needs treatment or surgery for these diseases, then its bill will be paid by the state authority. Labor Board registration – if any applicant is interested in getting financial assistance, then he or she will have to make sure that they have a valid registration card. This registration code will be given by Labor Board of UP. Residential criteria – As the scheme has been designed, developed and will be funded entirely by UP authority, thus, it is mandatory that applicants are legal residents of this state and possess papers to support the claims. Income related criteria – The implementation of this scheme has been done to meet the financial requirements of poor and needy labors. Thus, applicants with BPL card will get the opportunity of acquiring the financial assistance. Registered under Labor Board of UP – All construction workers or other labors, who have registration from the Labor Board of UP will be eligible to get economic assistance for treating the identified diseases. For serious illnesses only – As per the rules of this scheme, the state has identified eight serious illnesses. Any construction worker, who is suffering from these diseases, will get the financial aid for treatment. Treatment in government hospitals – An applicant will only be considered eligible to acquire financial assistance to treat any serious illness, if he or she is admitted in a government hospital. If they are transferred in a private organization, the aid will no longer be available. Candidate should not pay any tax – It has been mentioned in the scheme draft, that any applicant who is under any tax structure will not be able to acquire the benefits of this scheme. It is mainly for catering to the poor categories. Absence of government employees in the family – If any family member of the applicant is associated with a government job under the state or central authority; then the applicant will not be able to get free treatment. For family members as well – The family members of any registered workers will also get the financial assistance for treatment of any of these eight serious illnesses. If any registered labor has an unmarried son or daughter, she will also get financial coverage. Residential documents – All applicants will have to provide a residential document that will assist in the task of verifying whether that applicant is actually a resident of the state or not. Registration of Labor Board of UP – All applicants who desire to get access to free treatment must have their registration papers, issued from the Labor Board of Uttar Pradesh. It is an important piece of document and without this; the application will not be processed. Low income certificate – The scheme will provide benefits to those who do not have the financial strength to handle their medical expenditure. Thus, providing an income certificate is a must. BPL certificate – As the state targets the poor and needy strata, each applicant will have to attach a photocopy of their Below Poverty Level certificate with the application document. Aadhar card – It is critical that the applicant provided a photocopy of his/her Aadhar card. The code will assist in tracking the status of each application and will also keep track of the number of candidates benefited by this program. Treatment related papers – Due to the seriousness of the treatments, it is mandatory that all treatment related papers, doctors’ certificates and hospital admission papers are attached with the application. Vouchers of medicine purchase – As the candidate will get money spent for purchasing medicines, all vouchers and bills, given from the medical shop have to be attached with the application form. Applicants who wish to get financial assistance from UP government will have to collect the application form from the authorized website or from the respective department. Once they have this form, it must be filled with all relevant details. The name, address, contact details of the patient and his or her family members and the nature of the disease must be mentioned. After this, all relevant documents, issued by the hospital and the doctors must be attached with the form. Other important documents must be attached as well. The purchase receipts of medicines are also needed. Once all papers are in order, the applicant must submit it at the hospital counter or at the office of the health department. As this scheme has been launched recently, the state will soon declare the final procedure of making a claim. When this welfare scheme is implemented, poor and needy sections of the society, especially people who belong to the labor class will not have to worry about arranging money to pay the elaborate bills in hospitals.